Natasha is a bright, inquisitive, eight year old girl and her father is serving in the military, thousands of miles away. They have just moved to a new city, a new apartment building, and Natasha has started yet another new school. Natasha, who suffers from anxiety, now has to find new friends, again. Through a series of books, readers will discover an elaborate world that Natasha immerses herself into. Natasha writes about magical creatures, dragons, fairies, unicorns and a enchanted tree, that was once just a tiny twig – but grows up to catch children’s wishes and dreams – in the centre of a forest named – Natasha’s Wood. The children gather here to become friends an d to share their joys and their fears and to learn from each other, but also to keep this magical home, this forest and its great, big tree, safe. In the story line of Natasha’s Wood, while the children’s parents – emergency workers and serving our Canadian Armed Forces go out to protect the community, our country and indeed the global village beyond – so do our fun little characters in the early reader picture book series – Natasha’s Wood. They too, the children of Canadian Armed Forces, former and current military members, RCMP and other service members come together as great friends to help save the beautiful forest of Natasha’s Wood. On a very sunny day in a secret garden full of wild and wonderful flowers, a small seed pops up from under the ground. This tiny seed uncurls its first leaves and takes the shape of a small twig. Even though she is just a twig, and not very big, her heart is full of hope. 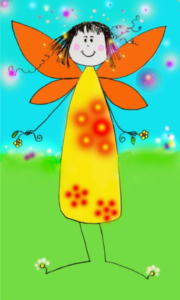 Named Twiglet by her fairy friends, she pledges to catch children’s wishes in leaves as big as dishes. Twiglet will grow up to be a tall, majestic, maple tree. But always remember, Twiglet is more than just a tree, she is magical. As she grows taller, she becomes the meeting place, a safe place, a home away from home for many tiny fairies, baby dragons and other magical creatures that call Natasha’s Wood their home. In the magical land of Natasha’s Wood, Twiglet and her friends will show us all just how powerful friendship, hope and love can be. Even the smallest fairy can offer hope to others! Now that’s powerful magic – made from love! I’ll catch children wishes in leaves as big as their dreams.